Now that we have your attention! Let’s get trained in life-saving skills thanks to our Sheboygan County United Way partnership! All residents can receive free health & safety training. 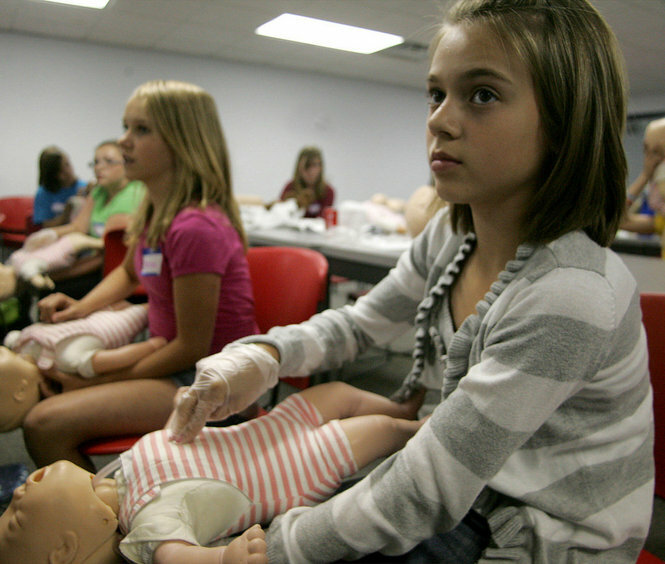 That’s right, from babysitting skills to first aid to even how to perform CPR or use an AED! No strings attached! You just have to live in Sheboygan County, register (first registered basis) and attend the class by June 30, 2014. Babysitter’s Training – designed for youth ages 11-13. Classes are available at the Red Cross building at 2032 Erie Avenue, Sheboygan. For a complete list of courses descriptions, times, requirements, please go to www.redcross.org/Take-a-class. You can also register by calling 800-RED-CROSS (800-733-2767) and press Option 3. You must provide the Coupon Code of UWSHEBOYGAN0614 for the course to be complimentary. If your organization, group or club wants to train a group of people at the same time, please contact terry.roe@redcross.orgor by calling 715-590-4495. Would you know what to do in this situation? Click HERE to read this life-saving story! By Erin McClam, Staff Writer, NBC News – Click HERE for video of story. A Georgia mother says her infant son is alive today because of two neighborhood boys, ages 9 and 10, who showed her how to perform CPR when the 12-week-old baby suddenly stopped breathing. Susanna Rohm, who lives in Marietta, told NBC affiliate WXIA in Atlanta she noticed something was “off” about her young son, Isaiah, on the frightening day last week. The boy had stopped responding to her and gone limp; when Rohm put her finger under his nose, she realized he wasn’t breathing. She ran outside and yelled for someone to call 911, and two boys who were playing football, 9-year-old Rocky Hurt and 10-year-old Ethan Wilson, rushed to help her. Rohm says she was panicking, splashing water on the baby’s face and trying to do CPR. “I told her to push on the baby’s chest five to 10 times with only two fingers, tilt back the baby’s head, plug the baby’s nose and breathe into the baby’s mouth,” Rocky told WXIA. Rohm says the boy said it so confidently that she listened to him right away. Within seconds, the baby began screaming. “I told her that’s a good sign because the baby’s breathing,” Rocky said. Paramedics arrived a short time later. Rohm told another Atlanta TV station, WAGA, that the baby spent two nights in the hospital, was diagnosed with sleep apnea and is being watched by doctors. According to WAGA, the scare happened last Monday. Rohm said she had never met the boys before, who live near her in Marietta, which is outside of Atlanta. The boys say they learned CPR from posters in the cafeteria at their school, Sedalia Park Elementary. This is just one story on how with even a little bit of knowledge, you can save someones life! Why not get trained as a family – check out our NEW Online Family First Aid & CPR course. — take the lessons in any order and at any time — you will have unlimited access to the course for two years. PLEASE NOTE: This course does not provide certification. Use the coupon FAMILY0313 and get $5 off until 3/31/13. Click HERE to sign up today! Each year, nearly 4 million people learn how to save a life in American Red Cross First Aid and CPR/AED training classes. To get a jump start on your New Year’s resolutions you can take advantage of special offers now through January 31, 2013. People can save 20 percent on the price of a First Aid and CPR/AED course. Participants learn how to perform CPR and use an AED, what to do if someone is choking, and how to prevent and respond to other emergencies. How to control bleeding as well as how to care for seizures and other sudden illnesses are also covered. Red Cross First Aid and CPR/AED training helps meet OSHA standards and professional licensure requirements. Courses are offered in traditional classroom and blended learning formats. Blending learning is a combination of online learning and a shorter in-person skills session. The course fee includes a 2-year certification with online skill refreshers and digital materials. People can call 1-800-REDCROSS or go to redcross.org/takeaclass for course schedules and to register. Use HOLIDAY0113 as the coupon code to receive the 20 percent discount. Lifesaving training courses can make a great gift for new parents, caregivers and those who need to refresh their skills. People can register loved ones by calling 1-800-REDCROSS and selecting Health and Safety training from the menu options. The Red Cross is also offering 20 percent off the price of First Aid Kits and other emergency preparedness items available at redcrossstore.org. Use the HOLIDAY0113 coupon code to receive the 20 percent discount. These special offers on training and products cannot be combined with other discounts. Each year, nearly 4 million people learn how to save a life in American Red Cross First Aid and CPR/AED training classes. People in North Central Wisconsin can take advantage of special offers now through January 31, 2013. If you were one of the 25 percent of Americans who have been in a situation where someone needed CPR, would you know what to do? During National CPR and AED Awareness Week (June 1-7) and throughout the year, the American Red Cross encourages people to take CPR/AED training to learn how to save a life. The ability to perform CPR can make a lifesaving difference when someone suffers a cardiac or breathing emergency. Here are a few stories from people who now know how important that knowledge can be. “Many years ago while I was in college, I volunteered as an assistant coach for the high school softball team,” Jane wrote. “I was watching a game on a hot and humid Iowa evening when suddenly there was a commotion in the dugout. The catcher had gone down. I had extensive Red Cross training so the coach asked me to help. The catcher was in trouble. It was the opening day of the 2003 trout season in Pennsylvania when Rita used her Red Cross training to help save a life. She was at a lake with crowds of others fishing, when she heard a faint cry for help. “An older woman was sitting on a porch, the man next to her in obvious distress,” Rita said. 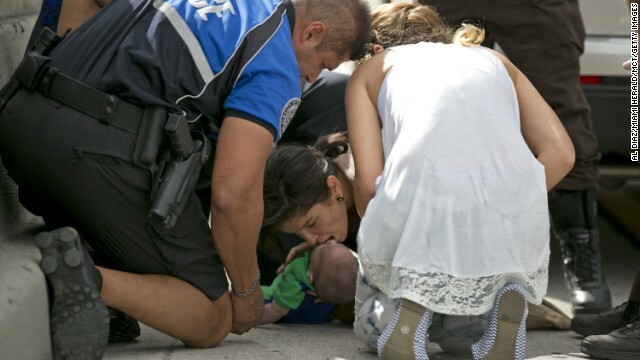 Teri used her training to save her grandson’s life. “Andrew was seven years old when he tried to catch a grape in his mouth. He caught it and we all clapped, but he didn’t reply,” Teri said. “He dropped to the ground and I jumped up and rolled him over. His lips were turning blue and he had the most terrifying look on his face. I was scared, but because of my training I didn’t panic. The Red Cross trains millions of people each year in CPR and AED and offers several training options, including a 30-minute Citizen CPR class which teaches Hands-Only CPR and full CPR training. All First Aid, full CPR and AED training carry a 2-year certification. You can find more information and register for a class by visiting the CPR and AED page on our web site. In addition to training, the Red Cross can help you obtain an AED for your home, business or organization and offers AED program management, maintenance and service. 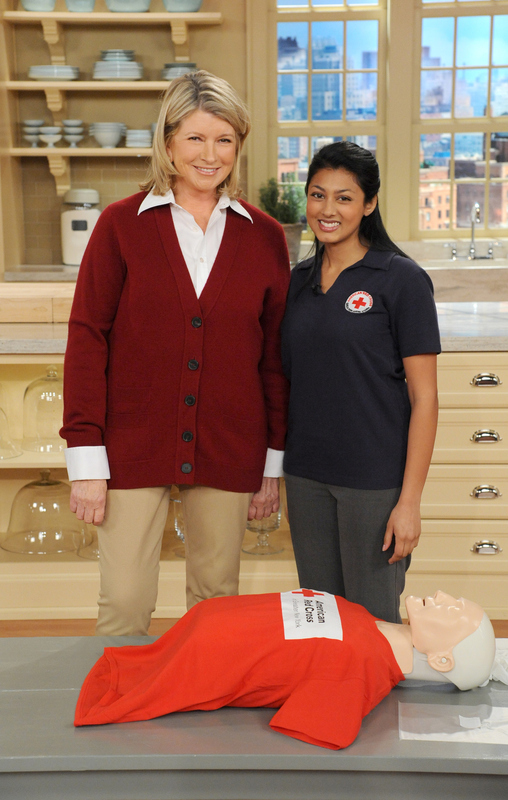 Even Martha Stewart knows the importance of life-saving training that the American Red Cross has to offer. On February 29, The Martha Stewart Show included a five-minute segment featuring Greater New York PHSS instructor, Lipica Shah. During the segment, Lipica demonstrated the basics of CPR and Martha gave it a try as well. The episode was part of the “20 More Things You Should Know” series. Martha believes everyone should have proper training and know how to perform CPR. The Red Cross couldn’t agree more! Click HERE to view footage from the show! CPR is a few segments in on the video. To learn more about Red Cross training or to register for a class, please visit www.redcross.org and click “Take a Class” or call 1-800-RED-CROSS.